After living a healthy and happy life, Lisa suddenly discovered she had a condition that only one in a million people develop. Soon after, she was put on the waiting list for an immediate liver transplant. Now, she and her husband are advocates for organ donation and transplant research. 2014-the start to a new year. Dreams were discussed and plans had been made for the new year! My husband, Reid, and I are high school sweethearts, we had our entire lives ahead of us. I had my dream job as a dental hygienist, I was completely healthy (or so I thought) and had never had health issues prior. Reid was coaching and teaching and we had our future planned out. Reid and I had been married for one year and seven months and were 25 years old when the plans we had made for that year would soon be detoured. On February 2nd, 2014 after going to the ER for extreme abdominal pain we would soon find out that I had a rare liver condition called Budd Chiari (occlusion of the hepatic veins that drain the liver) that only ONE in a MILLION people develop. After being placed in the ICU, with my liver failing, and my kidneys and pulse also becoming weak; I was CareFlited to a transplant hospital in Dallas. Upon arrival to their ICU, I was immediately put into a medically induced coma so my body could rest. A bone marrow biopsy was done to determine what caused my liver condition. The cause ended up being a blood disease, thrombocytosis, that I was unaware that I had. My only chance for survival was going to be a complete liver transplant from a deceased donor. I was put on the top of the transplant waiting list as Status 1A which meant that I had less than 48 hours to live if I did not receive the gift of life. A complete miracle came after being on the list for 10 hours. My husband got the call that a healthy liver was available from a 15-year-old female who had passed away in a car accident. During this donor families’ worst day of their lives, they chose to say YES to organ donation so that others may live. On February 6, 2014, I received the gift of life! 3 ½ years later, I have now celebrated four more birthdays, four more wedding anniversaries, seen the birth of my two nieces, become a passionate advocate for organ donation, and have made many special memories. The most exciting new update is that my husband and I are starting our adoption journey. Because of the gift of life I was given, I am now able to become a Mommy. The beauty of that is never lost on me. I have developed a beautiful relationship with my donor family. I actually call them my Godparents and they call my husband and I their Godchildren. It is a relationship that neither of us ever wanted. We often say that some of the greatest people we have met were people we wish we never had to have met. I never wanted to be a transplant recipient and they never wanted to be a donor family. However, we are so thankful to have each other. 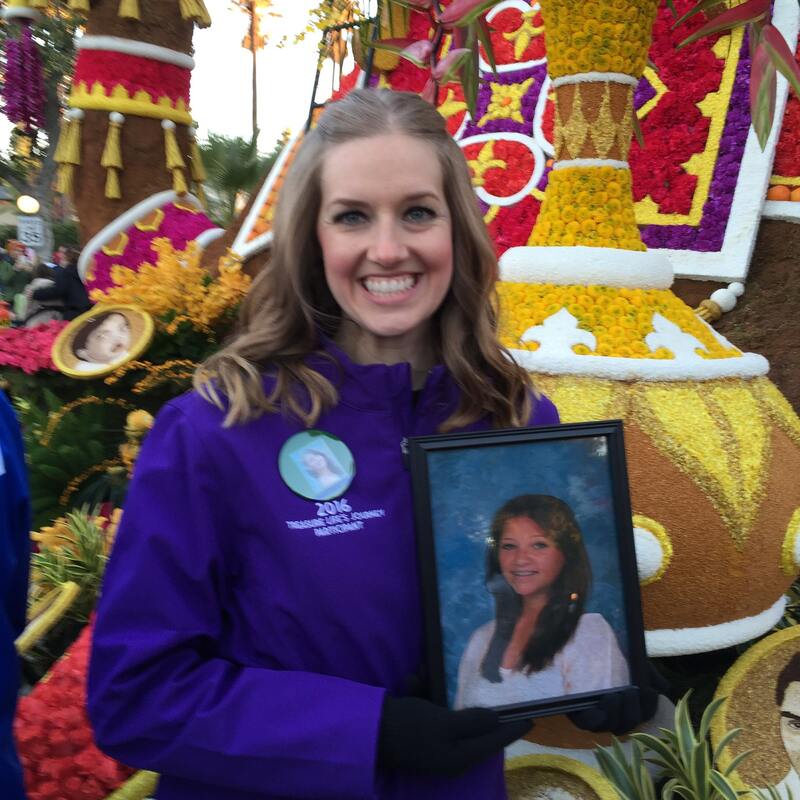 We have had some beautiful memories together and one of our favorites includes participating in the Donate Life Rose Parade Float. Courtney was honored as a floragraph and I was honored as a recipient on the float in the Rose Parade in Pasadena, California in 2016. It is our life mission to educate and for the world to see the beauty of donation and the relationships that can form because of it. Organ donation springs hope from tragedy! My Godparents are so thankful that I am still alive and that their beautiful daughter lives on. I am honored to carry on her legacy and I am passionate about raising awareness and educating the public on the importance of organ donation. My husband and I have written a book on our journey and have a website with more information on our mission and passion for the donation community. Research for the prevention of organ rejection is so important. I pray that I will continue to live a life that is rejection-free so I can continue to live my life and Glorify God and my organ donor through my second chance at life that has been granted to me.